1.Take your chosen sheet from the Floral Muse 6x6 paper pack and trim down to 14.5x14.5cm. Then glue your paper square to the centre of your card blank. 2.Pick a coordinating piece of Floral Muse paper and cut down to 12.5x12.5cm. Adhere to your card in the centre, at an angle. 3.Glue a Doily from the Floral Muse collection to the centre of your card. Next, cut a piece of Floral Muse paper down to 7.5x12.5cm and rip the bottom edge to create a torn effect and stick down over the doily. TIP When choosing your papers, choose different designs and patterns for each layer to add interest to your card. 4.Stick a‘With Love’ sentiment a 1/3 down from the top of your last layer. Encase your sentiment with a Floral Muse frame using 3D foam pads. Cut out a butterfly from the paper pack and adhere to the frame using double sided tape. 5.Add Two adhesive pearls to the centre of the butterfly and bend the wings slightly up, to add dimension. 6.Using the Fiskars heart punch, punch out two hearts from the Floral Muse pack and stick down with 3D foam pads, one on the top left corner and one on the bottom right corner. 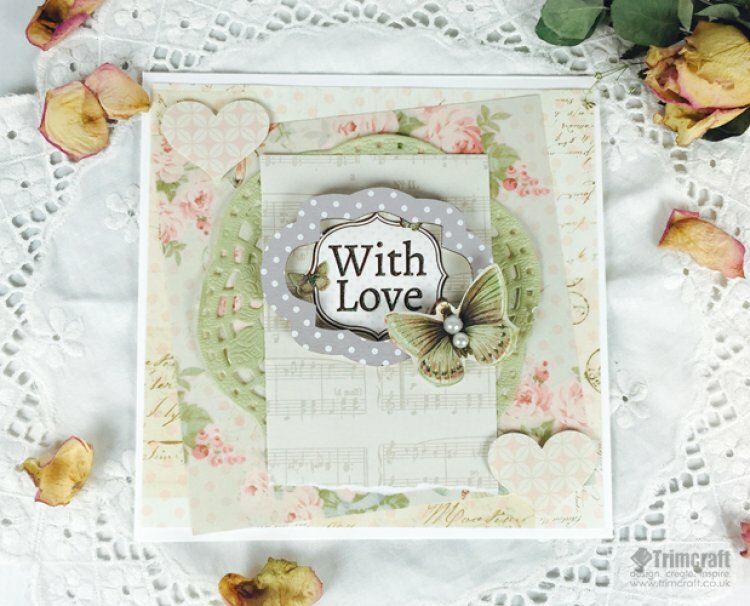 This easy make is a great inspiration for a range of card making projects, how do you like to use the pretty Floral Muse collection? Don’t forget to upload your lovely makes to the project gallery!